We have been trying to find a perfect pumpkin cookie recipe for about four autumns now and most recipes have sort of failed. Because pumpkin is such a wet ingredient, it is difficult to incorporate it into cookie dough without ruining the texture and turning the cookies into little cakes (which still can taste good, but a fluffy and soft texture isn’t ideal for a cookie). This year, prior to these particular cookies, we tried an eggless pumpkin cookie recipe. The dough was good, but the cookies themselves were gummy even after close to 15 minutes in the oven. We turned to reliable Annie’s Eats and finally found a pumpkin recipe that made more sense- adding oats to offset the soft dough. 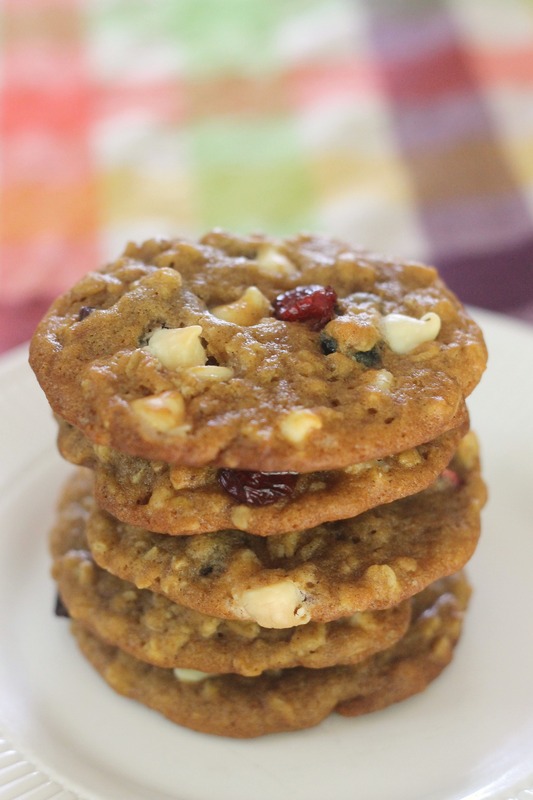 These pumpkin oatmeal cookies are fall heaven in a cookie. While we’ve never been ones to turn up our noses at a cake-like pumpkin cookies, it was nice that these cookies had the same sort of texture that most oatmeal cookies have: slightly chewy in the middle with crisp edges. These are worlds better than all the other pumpkin cookies we made. What makes these particularly awesome is that they include white chocolate and dried cranberries in the dough. 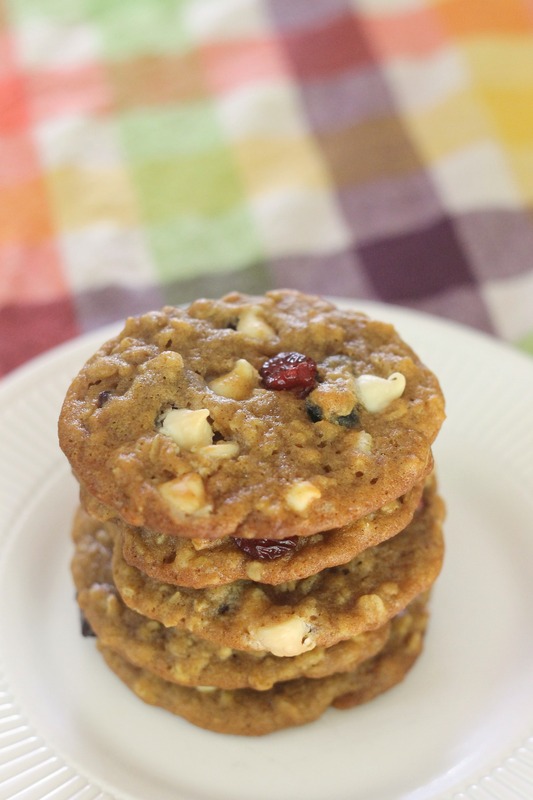 With an ingredient list that includes pumpkin, spices, oats, white chocolate, and cranberries, you know that the final result is going to be amazing! Preheat your oven to 350˚ F. Line your baking sheets with parchment paper. Whisk together the flour, baking soda, spices and salt in a medium bowl. In the bowl of an electric mixer, beat together the butter and sugars on medium-high speed until fluffy, about three minutes. Beat in the egg and vanilla. Beat in the pumpkin until combined. Mix in the dry ingredients on low speed until just mixed. Stir in the oats. With a rubber spatula, fold in the white chocolate chips and cranberries. Drop by 2 tablespoons onto prepared baking sheets, spaced a couple inches apart. Bake 12-14 minutes, or until the cookies are lightly browned (rotate the sheets halfway through baking for even browning). Allow the cookies to cool on the sheets for a few minutes, and then transfer them to a wire rack to finish cooling. Store in an airtight container for up to two days (we thought these were best within 24 hours of baking). Enjoy! If these turn out like they look I am going to be very pleased! May I use fresh pumpkin? Yes, I would assume that fresh pumpkin would work well! I haven’t personally worked with it before, but here is a link with more info that might be helpful to you: http://www.annies-eats.com/2010/09/23/homemade-pumpkin-puree/. As long as you strain it to the same consistency as canned pumpkin, I can see no reason why it would not work! Can pumpkin pie spice be substituted for all the spices? I haven’t tried it, and I would probably still add the cinnamon, but I think you could use pumpkin pie spice in place of the ginger, cloves, and nutmeg. The cookies won’t taste exactly the same, but I am sure they would still be good. I hope you enjoy them! Thank you- I know that you will love them! Let me know how they turn out with the homemade puree. I’ve only ever used canned, but it might be fun to try my own sometime! I didn’t have good luck with these cookies. They never did crisp up and I left them in the oven for quite a bit longer than specified. They had a pleasing taste but their texture was too soft and they ended up melting into each other in he cookie jar so I ended up with a cookie mass. Sorry to hear that! My only guesses are that perhaps your butter was too soft or your measurements were a little off. Other than that, though, I’m not sure why this would have happened. These cookies, while a lot firmer and chewier than most pumpkin cookies, definitely aren’t super crispy either. They shouldn’t have been fall-apart soft though, which means that something went wrong (which I’m sorry to hear!). Loved these cookies! I only baked them for 11 minutes though because the bottoms were getting burnt on the first batch. I think it is my oven though since I bake everything as a lesser time than shown. I also added nuts to them which I love. I loved these cookies! I also added nuts to them which I love. I only baked them for 11 minutes though since my first batch was a little too dark on the bottom. I think that it is my oven though since everything seems to cook / bake faster than the recipes say. I am glad you enjoyed them!